Published on July 19, 2011 in Africa, General T&T, Race and Identity and Racism Watch. 20 Comments Tags: Africa, African, Emancipation, Kwame Nantambu. As T&T celebrates the United Nations-sponsored “International Year for People of African Descent,” it is a sine qua non to analyze/investigate the crucial reality of being Trinbagonian versus, albeit compared to, being of African descent in this Euro-centric environment. The stark reality is that the ordinary Trinbagonian of African descent does not regard himself or herself as African. He/she is Trinbagonian, period. Published on July 17, 2011 in General T&T, International and Politics. 3 Comments Tags: Aviation, Devant Maharaj, Politics, Redjet, T&T Govt. The Government is pleased to announce that the court action brought by the operators of Airone Limited, trading as REDjet, commercial air services, against the Civil Aviation Authority of Trinidad and Tobago and Mr. Amral Mohammed, in his capacity as Chairman of the Air Transport Licensing Authority of Trinidad and Tobago has been settled on terms which are mutually acceptable to all parties. Published on July 17, 2011 in Crime in T&T, General T&T, Law, Politics, Security and Violence. 3 Comments Tags: Crime in T&T, Patrick Manning, Raffique Shah, T&T Govt. IN Frederick Forsyth’s 2010 novel, Cobra, the central character, Paul Devereaux, a former CIA agent, is tasked by his President (mucho resemblance to Barack Obama) to put an end to the cocaine menace that is strangling America. Devereaux demands, and is given, $2 billion plus a carte blanche instrument of authority to launch his war on the Colombian Cartel and its global tentacles. He hires as his operations officer a former foe, Calvin Dexter, and within one year they put together a powerful machine of personnel and equipment that attacks Don Diego and his overlords with extreme prejudice, as such exercises are described. Published on July 16, 2011 in corruption, Education, General T&T and Politics. 12 Comments Tags: Abuse, Politics, Selwyn R. Cudjoe, T&T Govt. I am sure that you were pleased as I was to learn that 14 students from one class in the Chaguanas Government School placed among the top one hundred students in the recent SEA Examination. Initially, my instinct was to accept the result and to applaud the exemplary teaching that takes place in that school; that is, until allegations of cheating were brought to my attention. Although I wanted to disregard this unfortunate conclusion, my desire for fairness led me to contact a statistician from William Patterson University in New Jersey, USA, and a mathematician from Wellesley College in Wellesley, Massachusetts, to determine the statistical possibility of such a result occurring. Published on July 10, 2011 in General T&T, People's Partnership and Politics. 14 Comments Tags: Jack Warner, Politics, T&T Govt. The overwhelming popularity of Works and Transport Minister Jack Warner has a part to play in him being cut down to size in the recent Cabinet reshuffle. 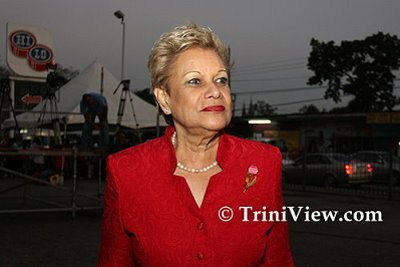 A plan, Sunday Guardian understands, was hatched to frustrate Warner out of the Kamla Persad-Bissessar led People’s Partnership (PP) Government, mere weeks after her resigned as vice president of FIFA. There had been rumours circulating more than six months ago that the PM had plans to split Warner’s ministry. Warner however, was unaware of this. Published on July 10, 2011 in General T&T and International. 2 Comments Tags: Chaguaramas, Dotishness, Raffique Shah. THE disaster that engulfed the Chaguaramas Peninsula last Sunday was a classic but toxic mix of skilfully marketed foreign “bull” and unmitigated local “dotishness”. That thousands of Trinidadians would knowingly subject themselves to torture, just to see other equally stupid Trinis “pilot” some crude “craft” that plunges into the sea in seconds, speaks volumes about our collective stupidity. Published on July 6, 2011 in General T&T, International and Politics. 11 Comments Tags: FIFA, Jack Warner, Politics, Selwyn R. Cudjoe. I have had mixed feelings about Jack’s fall from grace. I have not been able to garner the venom that some have displayed toward him nor the delight others have taken in his departure from FIFA. I am yet to see how Jack’s actions have so maligned Trinidad and Tobago that I have to hang my head in shame when I am in the outside world. Few Americans hang their heads in shame in light of Madoff’s shenanigans.